You know, playing tf2 all day really didn’t help me translate. That caught me by surprise. Anyways, here’s the chapter, hope you enjoy it. The chapter was a bit harder to translate this time, since there were a lot of phrases and words in it that didn’t have an accurate english equivalent. But I tried. Oh, and regarding the side projects… you guys really don’t want me to take one on, huh? Do you guys just love me that much? You don’t want to see me get burdened by a lot of work? Awww.. you guys are too nice. I’ve been talking to much. Here’s the chapter. Peng Ga Ho was staring at his uncle, Peng Ryun Hui. He was a little confused. What’s up with this all of the sudden? The title ‘Demon Church’ held enormous weight in the martial world. Because of this, Peng Ga Ho swallowed his spit out of nervousness. Peng Ryun Hui had a faint smile on this face. The greatest power which the chief of the Alliance, Dao Emperor Baek Mu Ryang, could wield. If the flag was to be used, all the clans under the Alliance must have total obedience towards the chief’s orders. It was an object that could only be used once every decade, it wasn’t something that one could use on a whim. But once it came out, the Alliance was able to display their full potential. Peng Ga ho had an unsatisfied look on his face. He clicked his tongue, and asked a question. Peng Ryun Hui, seeing his nephew’s stubborn face, waved his hand to silence him. When Peng Ga Ho heard his uncle’s response, his face sank. Peng Ga Ho tilted his head in confusion. Peng Ryun Hui, after scanning the area by using his martial sense to confirm no one was around, whispered to Peng Ga Ho. Peng Ga Ho’s eyes sparkled. He instinctively knew something big was going to happen. Because of that, Peng Ga Ho’s tone also dropped down to a whisper. Peng Ga Ho was very surprised. He began to stutter without even realizing it. The Moon Edge Sword Technique. It was the sword technique that the Sword Demon, Ak Jung Pae, used. Ak Jung Pae was a figure that was said to have reached the godly realm in the martial world. He was truly a legendary figure. Peng Ga Ho thought a bit. The Sword Devil wasn’t famous just because of that. No, the Sword Devil was famous because he alone destroyed the biggest Martial Alliance that existed back then. The champion of the martial world in the past. The unrivaled expert, the “Godly Monk”, the Great Buddhist Teacher. The man, who was originally from the Shaolin temple, couldn’t even take 3 hits from the Sword Devil, and was chopped in half. Because of this event, multiple martial alliances collapsed, which resulted in the 5 Great Clans and the 9 Houses merging together to form the Alliance that exists today. Because of one man, the Sword Devil, the course of history turned greatly. For the North River Clan, who primarily relied on swords, obtaining the Sword Devil’s technique was extremely desirable. Peng Ryun Hui opened his mouth. An expert held an immense amount of power in his hands. So much so, in fact, he/she was even capable of transforming a minor clan to a major one in just one day. Peng Ga Ho slapped his chest, and responded with absolute confidence. Seeing that, Peng Ryun Hui’s face went through various changes. Eventually, his face settled on a very obvious fake smile, and spoke. Peng Ga Ho became a little annoyed, after hearing his uncle’s awkward response. Truthfully speaking, he had more expectations for the firstborn in the family, Peng Hyo Chun, instead of the second, Peng Ga Ho. He stopped himself from saying that out loud, and smiled. He could only smile at Peng Ga Ho. He quickly changed the subject before the conversation got any further. Peng Ga Ho was a little disappointed at his uncle, since he didn’t really believe in Peng Ga Ho. But he still saw off his uncle. And after his uncle went out of his sight, he quickly started packing provisions. If his uncle was unwilling to take him, he would go off on his own. He was a little worried about the fact that his father was going, too, but he just had to go unnoticed. There was going to be a huge battle between the Alliance and the Demon Church. He couldn’t just sit here in the countryside. Coincidentally, there was someone else who thought like Peng Ga Ho in the school. Cho Ryu Hyang sat at the seat prepared for him by Jo Gi Chun, and took a look at the teacher’s house. It was a home that matched Jo Gi Chun’s personality perfectly. It had a very… frugal feel to it. There weren’t many furniture, only some things that were absolutely necessary for living. Because of that, it gave off a lonely feeling. The teacher paused a bit after speaking. Proposing something a little unusual made the person who was proposing a little hesitant. And Jo Gi Chun never made a lot of proposals like this to others, to boot. But he felt that he was going to regret it if he didn’t say it now. He made a decision, and opened his mouth. The boy in front of him. If it wasn’t for today’s event, he probably wasn’t going to even really talk to the boy at all. But there was an event today. An event that sparked some excitement inside Jo Gi Chun’s heart. Especially the face that Eu Hyun Guk made. That really made him feel satisfied. Cho Ryu Hyang was a bit hesitant. Truthfully speaking, there wasn’t any more math he could learn from the books. This was probably because of the information the old man in his mind gave him, but there was also the fact that he read a lot of books in the past. The information in books just didn’t help him anymore. But then, he couldn’t really ask the old man to teach him. That was because he couldn’t really talk to the old man for lengths at a time, because his mind wasn’t developed enough. Learning under Jo Gi Chun was actually a big stroke of luck. That was why he was hesitant about all this. He felt that something was off, because there were far too many strokes of good luck up till now. 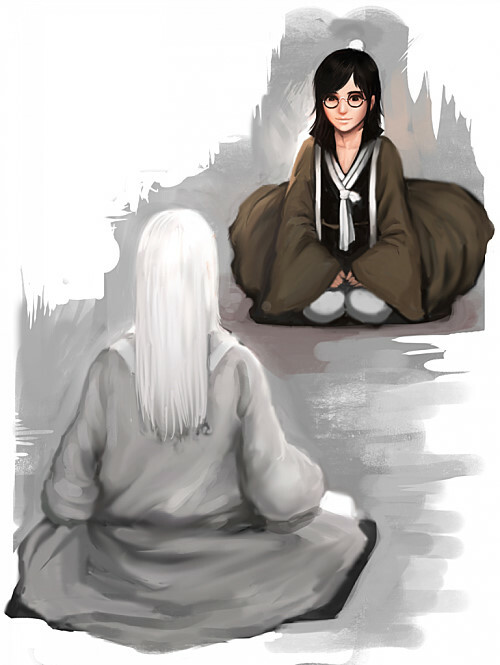 Cho Ryu Hyang organized his thoughts, and looked at the teacher in front. And he smiled slightly. After saying that, Cho Ryu hyang immediately bowed nine times at the teacher. Jo Gi Chun was eying Cho Ryu Hyang with narrowed eyes. He never approached someone in his life in a humane way like this. Things like marriage and such, too, were usually prearranged. He never approached someone in life, and no one ever approached him, either. But he thought he lived a pretty satisfied life. He couldn’t take care of the family, because he was so engaged in mathematics, but he himself was very content with his life. Was it because of his personality to not expect anything from someone? To think that it brought this much excitement when someone looked at him with an expression filled to the brim with expectations. Jo Gi Chun snapped back to his senses then. Perhaps he took on a really amazing disciple. He didn’t really think about it before, but now that he came face-to-face with the boy, this kind of a thought popped up in his mind. Jo Gi Chun coughed a bit, and thought calmly about something. His disciple probably knew about plenty of algorithms already. He could tell that from the boy’s problem solving speed. That kind of speed only appeared when one kept solving problems that required algorithms till their hand started to bleed. Then what should he teach the boy? How can he help the boy advance? Jo Gi Chun’s face became a lot more serious. Perhaps he dove into this too fast, too recklessly. He could only blame himself for acting too quickly. Jo Gi Chun was reminded of his life in the palace as he kept thinking. When he thought of that, his complexion brightened. He remembered things that he didn’t think was related to math at first. But only after a long time had passed did he realize the things had a lot to do with math. Cho Ryu Hyang was listening carefully. The teacher probably guessed his ability almost perfectly. Even then, the teacher gave him homework. It was probably an extremely hard homework. But that was what made everything so worth it. Jo Gi Chun started to write something on paper as soon as he finished speaking. No, it would be accurate to say that he was drawing. Jo Gi Chun finished drawing, and asked Cho Ryu Hyang a question with a face filled with expectations. After looking at the drawing for a while, Cho Ryu Hyang answered. Jo Gi Chun nodded. He didn’t show it on the inside, but he was actually extremely surprised inside. Indeed, his disciple’s ability really was formidable. Even he was unable to figure out what this represented when he first saw it. But his disciple was different. The boy didn’t even know what that was, or what it was used for, but he was able to accurately figure out it’s basic shape. Jo Gi Chun placed the paper on the table, and opened his mouth. Saying that, he pushed the paper on the desk towards Cho Ryu Hyang. Jo Gi Chun faintly smiled. If not for this, he wouldn’t have anything else to teach his outstanding student. Even though he was talking about it lightly, maintaining the formations in the palace truly wasn’t a simple task. That was because the formations in the palace were created by multitudes of the most skilled formations experts in the nation. Jo Gi Chun, who was able to maintain the formation all by himself, could be called a genius on his own. Cho Ryu Hyang was looking just at the paper since a while back. He knew that the homeowrk he would be assigned would be quite hard. Only, he didn’t expect it to be this hard. He already knew a bit about formations, since he heard about it from others a lot. But to think the formation could be laid out in numbers, he never realized that. It was a completely new realm to him. That made Cho Ryu Hyang’s heart pound. Cho Ryu Hyang was weak when it came to these kinds of things. Cho Ryu Hyang headed for his room after bidding farewell to his teacher. The formation given to him by teacher seemed exceedingly simple. But the more he looked at it, the more confused he got. That’s what got him excited. He didn’t know there were still so many things he didn’t know about math. After arriving at the room, he made it so that no one could enter his room, and then he opened his paper. Looking at the paper, he thought about it until he felt like his head was going to explode. Cho Ryu Hyang never saw a formation in his life. He only knew that such a thing existed due to various talk that he heard before. Because of that, when he approached such a thing with mathematics, something new sprouted in his head. It was a whole new world of number formations. To understand it and freely use it was probably beyond Cho Ryu Hyang. The complete form of the formation. Because he never saw the legitimate version of the formation in his lifetime, he wouldn’t know how to deal with the real one if it was in front of him now. In front of him was a formation, that was at the same time not a formation. Intertwining multiple algorithms to form a whole picture. Cho Ryu Hyang decided to approach it in a simple manner. This was not a boundary formation, but a different type of an equation. When he thought that, his heart started to beat even faster. To think that such a ‘thing’ known to the world as a formation could be expressed this way! Cho Ryu Hyang couldn’t hide his amazement. Perhaps the words of the old man in his mind was true. If formations could be expressed with numbers, perhaps the same thing could be done with anything else. But he didn’t know how that worked. Short breaths narrows one’s thought. But right now, he needed to think wider. Cho Ryu Hyang fixed his glasses while breathing deeply. Formations or whatever else there was, if it could be expressed in mathematical forms, it shouldn’t pose too much of a problem to Cho Ryu Hyang. Since he was at least confident with his math skills, there shouldn’t be too many big problems. He decided to start thinking like this to get himself a little relaxed. But once he opened it, he saw a giant monster residing inside it for the first time. And it didn’t take him even a day to understand it. Loving the translations. Keep the good work up. Thank for sharing, enjoying the story :). Looking forward to more. This story shows mad promise. The concept is unique and the setup is interesting. Much thanks, btw, translator-er, you’re the reason we get to read this. Thank you—!He has found a worthy teacher, and his first homework is difficult! However, this will certainly help him to develop further….looking forward to that, wahaha!